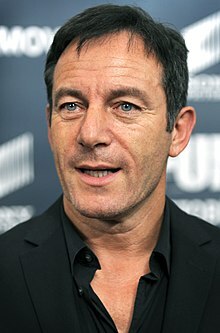 Jason Isaacs (born 6 June 1963) is an English actor born in Liverpool. He is Jewish. Blockbuster Entertainment Award for Favorite Villain (Internet Only) (nominated) (2001). British Supporting Actor of the Year, Awards for the London Film Critics Circle (ALFS) (nominated) (2001). Award for Best Acting Ensemble, Phoenix Film Critics Society (PFCS) Award (nominated) (2002). Award for Best Acting Ensemble, Phoenix Film Critics Society (PFCS) Award (nominated) (2003). Best Ensemble Acting Award, Gotham Awards (2005). "The Lady and the Tiger"
Best Performance by an Actor in a Mini-Series or a Motion Picture Made for Television, 65th Golden Globe Awards (nominated) (2008). Best Actor, BAFTA TV Awards (nominated) (2009). "#5.7 Gotta Look Up to Get Down"
Some of the information in this table was obtained from "Jason Isaacs: Filmography". Internet Movie Database (IMDb). Retrieved 2007-11-28. Some of the information in this table was obtained from "Jason Isaacs: Filmography". Internet Movie Database (IMDb). Retrieved 2007-11-28. Napoleon: Total War story teller from http://www.totalwar.com/napoleon/gallery/videos.php (Napoleon: Total War - Story Trailer). Wikimedia Commons has media related to Jason Isaacs. Marx, Rebecca Flint. "Jason Isaacs: Biography". Allmovie. Moviefone. Retrieved 2008-06-23. "Mark Kermode v Jason Isaacs on Johnny Depp". BBC Radio 5 Live. 2008-04-16. Retrieved 2008-08-17. Lester, Paul (2008-02-01). "JC interview: Jason Isaacs". The Jewish Chronicle. thejc.com. Archived from the original on 2008-02-04. Retrieved 2008-06-29. Mitovich, Matt Webb (2006-07-21). "Interviews & Features: Jason Isaacs: More Than a Bad Brother". TV Guide. TVGuide.com. Archived from the original on 2008-10-20. Retrieved 2008-06-24. Pfefferman, Naomi (2000-06-30). "More Than a Villain: With "The Patriot," Jason Isaacs, a British Jew, Cements His Reputation as One of Hollywood's Hottest Heavies". The Jewish Journal of Greater Los Angeles. jewishjournal.com. Retrieved 2008-06-29. &emdash;. "Once a 'wimp,' Actor Thrives On Portraying Villains". The Jewish News of Greater Phoenix. jewishaz.com. 2000-07-14. Retrieved 2008-06-29. Rees, Jasper (2007-01-27). "'There is a streak of cruelty in me': Jason Isaacs Says Life Prepared Him to Become a Specialist in Unattractive Characters". The Daily Telegraph, Review. telegraph.co.uk. Retrieved 2008-06-27. This page was last changed on 3 July 2018, at 06:39.